Today we are so happy to be able to introduce our two newest Portfolio WordPress Themes to you. 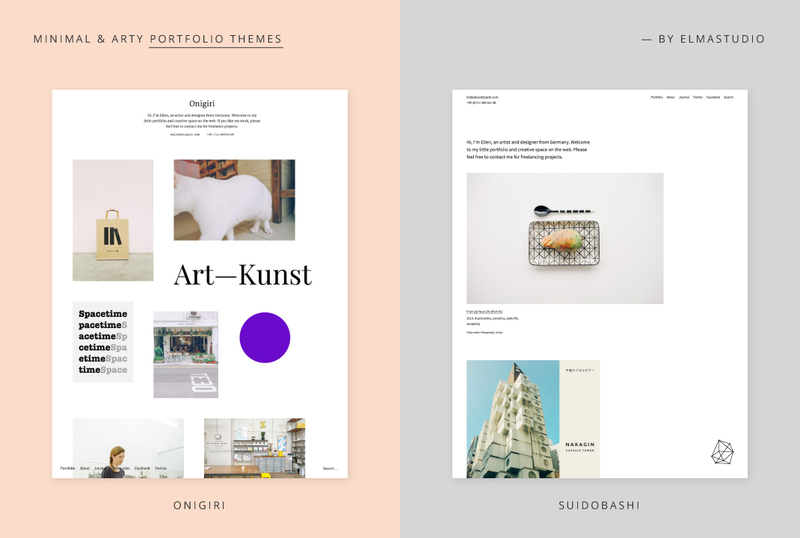 Onigiri (Live Demo) and Suidobashi (Live Demo) are two responsive Portfolio theme for designers, artists, photographers and other creatives, who want to present their work in a minimal, clean and arty way. Of course both themes also have a default WordPress blog option, so you are able to create a “Latest News” stream or write a small dairy or online journal on your website. The About pages are one the highlights in both themes, since you can create your own About page template and then choose an individual background and text color, just for your About page. You can also use shortcodes and special CSS classes to design your About page even further and individualize it to your needs. Onigiri and Suidobashi both also come with additional theme options in the WordPress customizer. Here you can for instance add a header slogan and include your contact details in the header. To create the Portfolio in both themes you will need to install the free Jetpack WordPress plugin. This is extremely important, if you ever want to switch to another theme using the Jetpack Portfolio feature or if you even want to switch between Onigiri and Suidobashi. 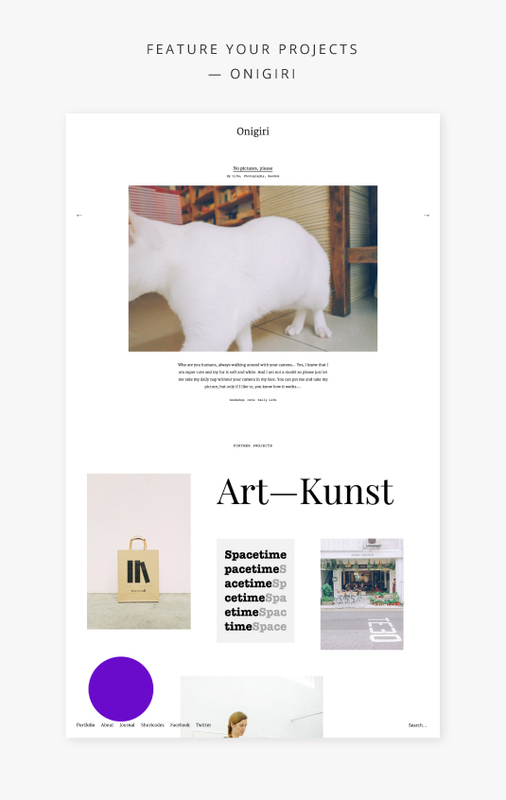 In the Onigiri theme you can create an arty, open grid layout on your portfolio front page by including your projects “Featured Images” in different image sizes. On single project pages further projects will be included below your project content. This way your visitors can easily look through your portfolio. Project images and other content can be included with the maximum size of 1280 pixels, using an extra div container with the CSS class “wide-content”. This way you will have lots of flexible options to feature your portfolio projects, artwork or pictures in your desired size. Suidobashi offers a minimal, elegant Portfolio front page layout, with a maximum image size of 960 pixels on the front page. On Portfolio project pages you can also include an extra div container with the CSS class “wide-content” to include big images, videos or other content. And just like in the Onigiri theme further projects will be displayed below your project content to make it easier for your visitors to browse through your portfolio. 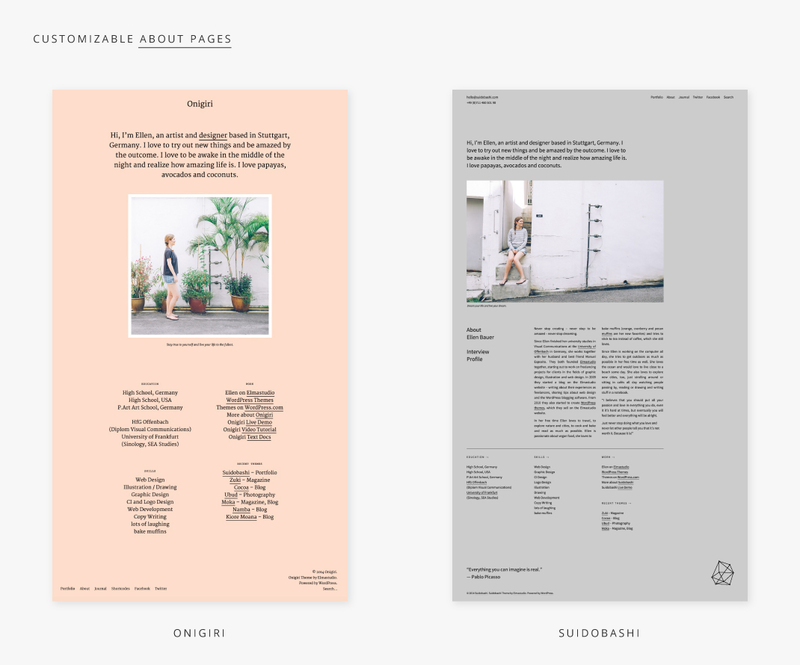 Onigiri and Suidobashi both offer an elegant About page template, which gives you the option to choose an individual background and text color just for your About page. With the help of shortcodes and special CSS classes for text styles you can design your own, individual About page with a beautiful layout. You will find the color options for the About page under Appearance / Customizer / Colors. The About pages in the Onigiri and Suidobashi theme. You can find further theme options under Appearance / Customizer. E.g. here you can include a header slogan or intro text in both themes and include your contact details (like your email address or phone number) in the header. You can also choose to fix-position your logo image or website title and hide the search form. Of course you will also find further color options in both themes. You can also upload your own logo image under Appearance / Header. We hope you will love both of our new Portfolio themes and you have already some first ideas in mind on how to use one of them. We are looking forward to your feedback, your questions and suggestions for improvements. Hello, i am very interested in buying the Suidobashi theme. I have one concern that i would like you to address if possible. On the previews above the portfolio items are set out like a grid. but when I open the demo they are in 1 column. Is there a reason for this or is there options to change it? I hope everything I have written is clear enough for you. I’m happy that you like the Suidobashi theme. The theme has a single column view for the project overview page (the Front page using the Portfolio Page Template) and on the single project pages up to 10 further projects are automatically displayed in a grid layout. This gives you the option to present your work on the front page with big images (up to 960px width). 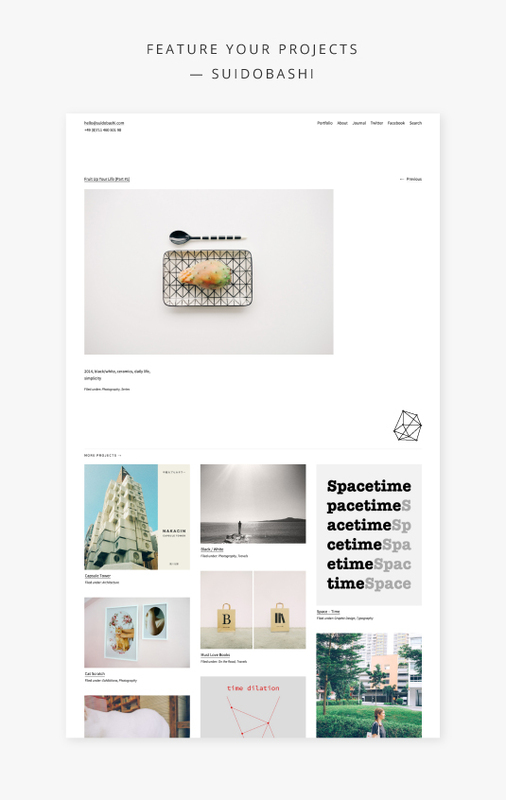 If you always a grid layout on the Portfolio front page, you might want to have a look at our Onigiri theme. Since you could also upload project thumbnails that all have the same image dimensions, you could also generate a more “ordered” grid view with the Onigiri theme. Regarding the logo, yes, by default the title will display as a text (using a 24px font style). Wir haben uns das Onigiri-Theme gekauft und versuchen nun vimeo-Videos einzubetten. Gibt es evtl einen Tip von eurer Seite wie wir die Videos größer bekommen? Muss ich zwangsläufig über Css gehen oder kann ich das auch individuell im html-Quelltext des jeweiligen Portfolio-Entrags ändern? Support an dieser Stelle wäre grandios! I just bought your theme ‘onigiri’ and I am struggling to get the images to ‘float’ as you have on the demo. They all stay in one column only and I would like them to appear slightly more randomly and with different sizes. I had a look at all the different options in the wordpress menu but can’t find one that relates to the columns. Could you please help me? The website I am building is https://belezaatipica.wordpress.com. It doesn’t have the correct images yet as I am still finding out how it works. ich hab euer Onigiri Thema gekauft, kann aber leider nicht die Funktion ‘Portfolio’ finden bzw. erscheint bei mir kein “Your Custom Content Types ” unter : Settings → Writing ? Des Weiteren würde ich gern das copyright und ‘powered by..’ auf der Starseite ausblenden, könntet ihr mir sagen wo ich das machen kann ? I have bought Onigiri and have a question re projects. I notice the last project I created appears always on top of the page. How do I rearrange projects? Can I back date some to make them appear further down the page? Widget ‘Frontpage Post Content 1’ – ‘Zuki: Recent Posts (Big 2)’. Can you please help me out with this because I tried to change various parts of css code in my child theme but it still doesn’t work. since you have a self-hosted WordPress website you can purchase Onigiri directly on our Website on the Onigiri theme page. The payment is via Paypal. After the successful payment you will receive an email from us including a download link to download the Ongiri theme folder. This file can then be uploaded to your WordPress website (in the Admin panel via Appearance / Themes / Upload Theme). If case you experience any trouble with the upload, please let me know again and I can help you further.